At the Center for Conscious Living you will learn to make positive changes in your life. Dr. Carol B. Low, a licensed clinical psychologist, is your guide to growth-oriented solutions and deeper self-knowledge. While predominantly focused on individual and family therapy, we also offer group psychotherapy as well as weekend intensives for out-of-town clients. 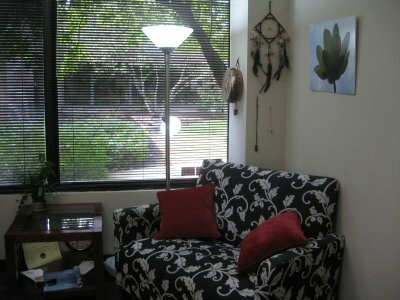 Specializing in efficient psychotherapeutic techniques such as clinical hypnosis and cognitive, rational-emotive, and experiential therapy, the Center offers effective solutions to enhance your life. The Center for Conscious Living has a unique practice philosophy. We believe your psychotherapy should be guided by a few basic principles. First, it ought to have a high probability of success. Next, you are entitled to share in all treatment decisions with your therapist. In addition, you should come away from your treatment feeling as though you have learned skills that you can use for the rest of your life, so that you do not become dependent upon your therapist. When possible, neither should you be dependent upon medications to feel psychologically healthy. Your treatment ought to be finished in a reasonable length of time. Finally, you are entitled to complete confidentiality and privacy as long as no danger exists. In the modern world, much is made of "evidence-based treatment". Overall, this is a great idea--you want to choose a treatment that works for you. The biggest problem with this is that the drug companies and their partners, the medical associations, have a great deal more money for research than the various departments of psychology or psychological associations. They can do infinite research studies until they get one that demonstrates that a given drug works. Analyses demonstrate, however, that many psychiatric drugs, particularly antidepressants, do not work--that the main benefit they confer is a placebo, while others, such as anti-anxiety drugs and stimulant drugs, are deemed addictive, and your physician hesistates to prescribe them, and still others, such as the anti-psychotics, or major tranquilizers, can have intense side effects. In addition to all of those negatives, medications do not solve the problem; they mask it; the problems you bring to my office are life problems, not illnesses. They respond best to learning and rehearsal and behavioral change, not pills. As a non-physician, I cannot prescribe pills, and I have learned a great deal about how learning works to effect changes. In modern times when psychologists are begininning to be offered the option to educate themselves to acquire prescribing privileges, I would not so choose. While some psychological struggles are served by medication,most are not. For most people, learning is more powerful and more life-enhancing than taking medications. YOU are your own best healer. I will be your guide. Yet another thing that should affect your treatment decision is that research in psychotherapy demonstrates that the therapeutic relationship and the assignment and performance of follow-up assignments by you, the client, are the most important variables in helping you to benefit from treatment. This is why before clients come in to meet me, I offer an extended free phone consultation--it is important that the relationship feels safe and effective to you personally. Once you come in, the best thing I can do for you is to teach you how to help yourself--to give you learning tools and learning assignments that help you to discover how to function better and experience less distress. This will help you to save money in the long run because you will feel better faster and have learned things that will help you to continue to feel better in the long term. In my experience, for many problems, Rational Emotive Behavior Therapy is the fastest way to do this learning and the easiest technique for you to learn quickly. Clinical hypnosis is a great adjunct in that it helps to consolidate the learning and access other parts of your mind for enhanced learning. What hypnosis does not do, to be clear, is to allow me to control you--to the contrary, it offers you a new means of self-control. Hypnosis as other powerful uses as well. It is a great tool in pain control, habit control, and the treatment of functional illnesses, which are those medical conditions not caused by actual disease process in the organ such as Irritiable Bowel Syndrome and Migraine Headaches. Using powerful therapeutic techniques, following the wisdom of the research, and working closely with you to determine the approach that is the most effective to solve your particular problem allows me to help you safely and efficiently. Unlike with pills, you will experience no negative side effects. As an active, directive therapist, I do not simply smile and nod; I actively guide and teach. The point is to get you out of therapy in a reasonable time frame, not to keep you coming back forever. The important message here is that the Center for Conscious Living is just that, a place for you to become conscious of how to help yourself, to develop the tools to do so, and to complete your treatment feeling more comfortable, competent, and self-aware. You ought always to be ultimately in charge of your thoughts, feelings, and behaviors. And your confidential medical information. Live more consciously and effectively. Discover self-hypnosis, and improve your self mastery. Gain control over your thoughts, feelings, and behaviors. Learn new problem-solving and communication skills. Make full use of your talents and abilities. Develop a sense of purpose and fulfill your goals. Achieve a better integration of reason and emotion. Discover and enhance your inner strengths. Enjoy more freedom of choice in your life. The Center for Conscious Living provides assessment and treatment for a variety of psychological and emotional problems and medical conditions with a psychological component. Learn more by clicking on the article links to the right. Please call us with your questions. Your initial phone consultation is always free. The Center for Conscious Living offers individual, marital, and family therapy for all ages, and intensive therapy for out-of-towners. Specializing in Clinical Hypnosis, Rational Emotive Behavior Therapy, and Sensorimotor Trauma Therapy. Call the Center at 916-936-2325.